Whether you are a first-time parent or are a veteran to parenting, having a baby is an exciting and wonderful experience unlike any other. As you prepare for this life-changing journey, there are certain preparations you, the expecting parents, must take to ensure the well-being of baby-to-be. One provision that is especially important for mothers is the consumption of the best prenatal vitamins. Unsure of which ones you should take? Overwhelmed by which brand is the best? Do you have dietary restrictions— such as a gluten allergy—and need a compatible option? Not to worry. We’ve generated a breakdown of the best prenatal vitamins of 2018. If this is your first pregnancy, there are probably hundreds of questions running through your head, including what you (the mother) should eat and drink. Chances are that you have at least heard of prenatal vitamins, but do you know which ingredients are in prenatal vitamins and what benefits they carry? Do you know which key nutrients you need as a pregnant mother-to-be? Even if you aren’t new to the process, it is important to refresh your memory on the essentials of the best prenatal vitamins and their ingredients. Whatever your case may be, we have the answers to some of the most common questions on the best prenatal vitamins for you. 1. What Are Prenatal Vitamins? 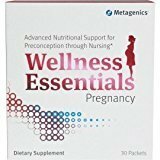 Prenatal vitamins are supplements packed with essential vitamins and minerals intended for women who are pregnant or who want to become pregnant. The best prenatal vitamins have key nutrients in them: folic acid, iron, calcium, iodine, DHA (essential fatty fish oils) and an array of other beneficial B vitamins, such as vitamin B6, which helps with nausea. 2. What Do Prenatal Vitamins Do? The primary function of the best prenatal vitamins is to provide additional nutrients needed to support the growth and development of a baby. They are especially important for pregnant women who may have nutritional gaps in their diet and can help prevent anemia and birth defects, such as neural tube defects (problems with the baby’s brain and spine chord) and congenital heart defects. 3. When Should You Begin Taking Prenatal Vitamins? If you are planning on becoming pregnant, it’s recommended to take prenatal vitamins at least one month before you try to conceive. However, seeing as about fifty percent of pregnancies are unplanned, any woman who has a high chance of becoming pregnant should take at least 400 micrograms (mg) of folic acid supplements daily. 4. What Vitamins Should You Take Before Pregnancy? Folic acid is one of the most crucial vitamins you should take if you are pregnant or want to become pregnant. Many studies have shown it can dramatically reduce the risk of neural tube birth defects, which can develop in fetuses in the first twenty-eight days after conception. Even if you aren’t planning on becoming pregnant, taking a folic acid supplement will ensure that your future baby will grow and develop healthily. 5. Where Can You Buy Prenatal Vitamins? Most over-the-counter prenatal vitamins can be purchased at a number of locations, including online and retail stores, such as Target and Walmart. However, with a prescription prenatal vitamin, you might be limited to your local pharmacy or doctor’s office. 6. What Are The Side-Effects of Prenatal Vitamins? Some women may experience mild nausea or constipation/diarrhea, both which have simple solutions. If you start feeling nauseous, try taking your vitamin with a snack before bed or with a meal. To relieve constipation (which can be caused by high amounts of iron in a prenatal vitamin), drink plenty of fluids, and eat fiber-rich foods. It is also recommended to include regular physical activity. If you see no change in your symptoms, talk to your doctor about alternative supplements or a different type of prenatal vitamin (i.e. chewable or liquid vitamins instead of capsules or tablets). 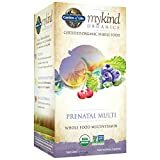 The following best prenatal vitamins were reviewed based on the following parameters: Features, Pros & Cons, Price, and Where to Buy. Each product listed was researched thoroughly and analyzed based on data collected across multiple medical, professional and consumer sources. The price range for these products range anywhere between $5 and $100. The average cost of the best prenatal vitamins featured on this list is about $55. Most brands above the $30 price range have most of the essential vitamins and minerals needed during pregnancy. Any product below that range may lack some important nutrients. EASY TO TAKE AND DIGEST: Plant-based enzymes and probiotics help make our multi vitamin supplement easier on the stomach, supporting your digestion to alleviate bloating and discomfort. * Just 2 easy-to-swallow veggie capsules once a day for all your daily multivitamin needs. EASY MONEY BACK GUARANTEE: Every body responds differently to dietary supplements. 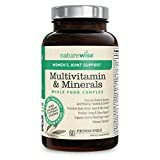 If this multivitamin isn't right for you, or you are unsatisfied for any reason, simply contact NatureWise for a full refund. No risk, no hassle. 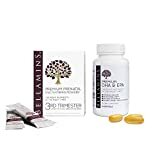 Key Features of this product include vegetarian-friendly capsules with a patented type II collagen formula, which supports joint mobility, flexibility and comfort. Key Features of this product include a dark concentrate liquid which has sources of both multivitamins and prenatal vitamins. This product can be found on Amazon for around $75 to $90. BEFORE, DURING & AFTER PREGNANCY: Pink Stork Total Prenatal provides the essential vitamins your body needs while trying to conceive, pregnant & after delivery. Prenatal supplementation is imperative before pregnancy, so your body is ready for baby. After pregnancy, your body loses so many vital vitamins and nutrients that you need to replenish - and if you're breastfeeding, they're passed on to your little one! Win-win-win. HIGH IN FOLATE, ZINC & VEGETARIAN DHA: Many women lack Folate, Zinc and DHA in their diets - Total Prenatal has you covered! These are essential for a healthy mama & healthy fetal development. Folate helps prevent neural tube birth defects - most of which develop in the first 28 days after conception, before many women know they are pregnant - that's why it's recommended for all women to take a high-quality prenatal as part of their daily routine. NON-GMO, GLUTEN-FREE, & KOSHER: Pink Stork Total Prenatal takes out the junk so your body can absorb all of the vitamins and nutrients you need. Key Features of this product include pregnancy-safe, vegetarian DHA (omega fatty acid, which aids in brain development) and a comprehensive blend of all the vital pregnancy nutrients and vitamins. 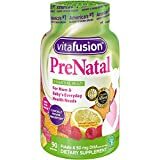 This product is currently unavailable on Amazon, however, a similar product—the Pink Stork Premium Prenatal Vitamin—is available for $15 to 30. Key Features of this product include a blend of thirty organic family-farmed foods. 2 packs with 180 ct. GENTLE, DELICIOUS DRINK MIX & FLAVORLESS GELCAP COMBO - tastier than gummy supplements with higher amounts of the most essential nutrients. 30 stick packs fit discreetly in a purse or pocket for use at home or on the go. IMMEDIATE BIOAVAILABILITY means nutrients are absorbed quickly. Your baby enjoys these nutrients within minutes. Key Features of this product include Quatrefolic™, the most advanced and best source of body-ready folate/folic acid available. This mineral is essential for proper growth and development for your baby. This product can be found on Amazon for around $55 to 75. Key Features of this product include advanced prenatal multivitamin support, choline (an essential nutrient in brain development based on current research), OmegaGenics EPA-DHA 720 (an omega-3 fatty fish oil designed to support fetal development, heart health, mood and overall health) and bone density support. Key Features of this product include lemon- and raspberry lemonade-flavored gummies designed to support immune health. Key Features of this product include a specially-designed formula with an additional level of nutrients, including zinc and vitamin D.
This product can be found on Amazon for around $40 to $55 . Key Features of this product include 800 mcg of folic acid to support the development of the fetal neural tube (brain and spinal cord). WOMEN'S MULTIVITAMIN SPECIALLY FORMULATED WITH SPIRIULINA - Advanced multivitamins with green superfoods for daily use. Fortified with green superfoods, these multivitamins blend crucial vitamins and minerals to fill nutritional gaps, support good health, and provide energy. SuperMom is for women who need broad spectrum nutritional support while pregnant, nursing and/or keeping up with a busy household, but is beneficial to women in all stages of life. HELPS KEEP YOU ENERGIZED - SuperMom builds oxygen-rich blood to keep you energized by supplying iron from amino acid chelate, the easiest form of iron for the body to absorb. Additional blood enrichment comes from chlorophyll -- present as a stand-alone ingredient and also as part of superfoods like spirulina and chlorella, as well as barley grass and alfalfa juice. GREAT FOR PRENATAL CARE & POSTPARTUM BREASTFEEDING MOMS - Many of the vitamins and minerals exceed daily requirements making SuperMom a great vitamin to take all the time. That way, if you're blessed with a pregnancy, you'll be well stoked up on this critical aid for avoiding possible birth defect from the start. SuperMom may also reduce or eliminate swelling and nausea during pregnancy. And it excels at helping your body make rich, healthy breast milk. DOSAGE - Take 2 tablets daily. 180 tablets = 3 month supply. Key Features of this product include advanced multivitamins with fortified green super foods including spirulina, barley grass, alfalfa juice, chlorella and chlorophyll. This product can be found on Amazon for around $45 to $65. While each of the best prenatal vitamins featured each have their own area of strength, there were two brands that stuck out from the rest. For the most comprehensive prenatal nutrient care, we would recommend Pink Stork Total Prenatal + DHA. Not only is it a fair and affordable price around $15 to $30; it has the recommended levels (or higher) of most essential vitamins. The one exception is calcium which is 57 mg short of the recommended 250 mg. It is also one of the few products sensitive to food allergies and preferences. If you are not trying to get pregnant but are thinking about having kids much later, we would recommend Beeyoutiful SuperMom Vitamin & Mineral Dietary Supplement as a starter multivitamin. Besides having supercharged vitamins and minerals, it is great for women in all stages of life.